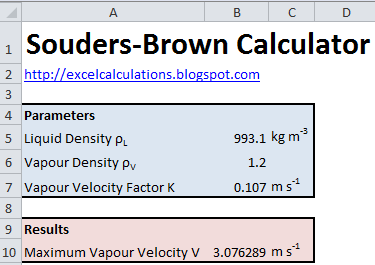 This Excel spreadsheet calculates the maximum allowable vapor velocity in a vapor-liquid separator with the Souders-Brown equation. The Souders-Brown equation is commonly used to size separators, scrubbers and knock-out drums. The operating vapor velocity is specified to minimize the entrainment of liquid drops in the exiting vapor. A wire mesh or de-entrainment pad is commonly used to force the separation of very small drops that cannot be removed by gravity alone. These coalesce the smaller droplets into larger ones fall due to the force of gravity. The Souders-Brown equation was derived from a force balance on a droplet suspended in a gas flowing upwards. It was originally derived to size fractionating columns. K has a value of 0.107 m s-1 for a separator with a mesh pad. However, the right value of K is largely dependent on the operating conditions and physical properties of the system. The GPSA Engineering Data Handbook tabulates values of K for various operating conditions. Once you have the maximum allowable vapor velocity, you can then calculate the drum diameter by dividing the vapor flowrate by the allowable vapor velocity.